Jackie Coogan (today best known as Uncle Fester on the Addams Family television series) was a highly popular child star in the 1920s, in no small part because of his title role as The Kid in Chaplin's film of 1921. Good vehicles for child stars are hard to come by, so literature is often the resort for studios wanting to capitalize on their momentary popularity. Oliver Twist, made the next year, was just such a vehicle. Coogan is both charming and spunky as the orphan boy in the workhouse who gets involved in a life of crime. After he is selected by the workhouse boys to demand an extra allotment of gruel, he is sent to apprentice with an undertaker. When threatened with a return to the workhouse, he escapes from the mortuary and meets a boy pickpocket, the Artful Dodger (Edouard Trebaol). The Dodger takes Oliver to meet the wicked Fagin (Lon Chaney), an old scoundrel who trains young boys to be pickpockets and thieves. Oliver is rescued from this life, however, by Mr. Brownlow (Lionel Belmore), but Fagin seeks to recapture his young protégé. The film closely follows the story of the Dickens novel, although it is of course much abbreviated. Other than Coogan, Chaney steals the show with his Fagin impersonation. Although a somewhat burly man, Chaney gives the impression of being incredibly thin, aged and stooped; this puts him on eye level with the boys and serves in part to explain why Fagin engages in such shady business. Chaney just plays Fagin wicked, and doesn't resort to racial stereotyping as Dickens had done in the novel. The supporting cast looks as if they could have stepped from illustrations in Dickens' novel. In particular, Bill Sikes (George Siegmann) has a meaty ferocity that suits the character well—at times he looks as if he were a bulldog with a rat in his jaws. James Marcus as the workhouse beadle, Mr. Bumble, and Carl Stockdale as the mysterious Monks also fit their parts well. On the whole, the supporting cast nicely underplays their roles, acknowledging tacitly that this is Coogan's and Chaney's show. This would almost fit into the 'family' category, but for a somewhat shocking hanging scene near the end; parents might want to preview this before allowing younger children to watch the film. Coogan's performance is thoroughly charming, even today. I'm not a big one on cute in films (which is why debi reviewed The Sound of Music), but I found him to be highly appealing and even endearing. He has a deft sense of comic timing and plays off the other characters well, shading his performance suitably to adapt to those around him. Image Transfer Review: The picture is sepiatoned throughout, with the exception of night scenes which are tinted blue. The tinting is subtle and adds nicely to the viewing experience. As is to be expected for a film from 1922, there are a significant number of scratches, speckles and the like. There is some flicker and jitter of the picture as well. However, no dirt on the frame was visible, and the contrasts and black levels are both excellent. A wide range of greys is present. The film is thoughtfully presented in a windowboxed format which prevents loss of picture to overscan. This is an essential part of presentation of silent films, due to the presence of intertitles, and I enthusiastically applaud Image's use of windowboxing here. The image grade would be 'B+' if the film were just compared to other silent films. As it is, it's a pretty good picture for its age. 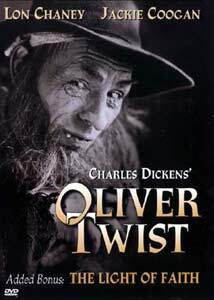 Oliver Twist and the companion film are both presented at their proper running speed. Well done! Audio Transfer Review: The organ score by John Muri comes through very nicely on the mono track. There is a great deal of bass presence which comes through the subwoofer on the low organ. Extras Review: The primary extra is another Chaney film from 1922, The Light of Faith. This is a condensed version of The Light in the Dark, but unfortunately the complete film does not survive. The condensed version, running 32m:40s, was placed on safety stock and thus we have it in extraordinarily good condition for a film of this era. In this outing, Chaney wears little makeup, playing thief Tony Pantelli. One day Tony meets a young woman, Elaine, (Hope Hampton) in his boarding house. She faints from illness and Tony takes upon himself the role of protector. In the meantime, Elaine's former lover, J. Warburton Ashe, has gone to England to forget her, when he runs across nothing less than the Holy Grail. Reading about the Grail in the newspaper, Tony decides to steal it to attempt to heal Elaine. It's a little difficult to assess this film based on the condensation; everything happens much too fast and a good deal of necessary exposition has apparently fallen by the wayside. For instance, everyone just seems to assume that this cup is the Holy Grail, although there's no apparent reason for them to think that. As such, it makes an appealing extra rather than a main feature (it was released on VHS by itself, making the DVD an even better deal). The editing aside, this is a beautifully photographed film. There is exquisite use of light and shadow throughout, but especially in the retelling of the Quest for the Grail. Striking imagery appears elsewhere as well, such as the shadow of the armed policeman on Tony's door, and the closing vignette of a disappointed Chaney walking away from the reunited lovers, only to be silhouetted in the round window of the door. It makes one long for discovery of the full picture. The music is a piano score by Hank Troy. There are several unfortunate spots where the sound becomes unstable and murky. This presentation is also slightly windowboxed. Otherwise, there's just about nothing more to be found in the way of extras. The chaptering of the main film is just barely adequate; that of the extra film is better, with 8 chapters. Two Lon Chaney classics on one disc, at the proper running speed, in nice condition, with good soundtracks, and windowboxed to boot. While the extra film doesn't have the general interest that Oliver Twist does, it has beautiful photography and preservation to its credit. A highly recommended disc. By the end, you'll be saying, Please sir, I want some more.